Bulent O. Yildiz, M.D., is a Professor of Medicine / Endocrinology and Metabolism at Hacettepe University School of Medicine in Ankara, Turkey. He earned his medical degree from Hacettepe University School of Medicine, and completed his residency in Internal Medicine, and a fellowship in Endocrinology and Metabolism at the same institution. He was a postdoctoral scholar at the Center for Pharmacogenomics and Interdepartmental Clinical Pharmacology Center, David Geffen School of Medicine at UCLA, Los Angeles, California, where he also completed a National Institutes of Health advanced training program in translational investigation. He has published over 80 original articles, reviews, and book chapters, and delivered several presentations, lectures and conferences worldwide. Dr. Yildiz is a reviewer for many international journals and research funding authorities and currently serves as the Associate Editor of The Journal of Endocrine Society. 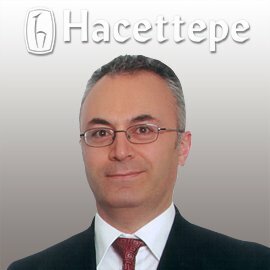 Dr. Yildiz is the founder and president of the EndoBridge®, a unique educational initiative which was first launched in 2013 and brought together in four years more than 1600 physicians and scientists from over 50 countries to share their expertise and interact with global leaders of endocrinology. EndoBridge® is supported by the Society of Endocrinology and Metabolism of Turkey, Endocrine Society, and the European Society of Endocrinology. Dr. Yildiz has served as the general secretary of the Society of Endocrinology and Metabolism of Turkey, and as a board member of the Androgen Excess and Polycystic Ovary Syndrome Society. Currently, he is an executive committee member and officer of the European Society of Endocrinology. He is also the Chair of the Program Organizing Committee of the European Congress of Endocrinology which will be held in Portugal in 2017. Dr. Yildiz has received several national and international awards including the Hot Topics in Endocrinology Travel Award from the Endocrine Society, the Distinguished Young Scientist Award from the Turkish Academy of Sciences, the Young Scientist Award of The Scientific and Technological Research Council of Turkey, and the Eisenhower Fellowship for international leadership from The Eisenhower Foundation of the United States. Fellowship of Dr. Yildiz focuses on the university-government-industry relations on research, public policy and healthcare delivery for chronic diseases, specifically diabetes and obesity. His current research and clinical interests involve the study of obesity, neuroendocrine regulation of food intake and body weight, insulin resistance, metabolic syndrome, diabetes, hirsutism and polycystic ovary syndrome.